Figure 1. Sections of a report. The Detail section is the main section of the report; it’s used to display the detailed data of the table or query underlying the report. Certain reports, such as Summary reports, have nothing in the Detail section. Instead, Summary reports contain data in group headers and footers. The Page Header section automatically prints at the top of every page of the report. It often includes information such as the report’s title. The Page Footer section automatically prints at the bottom of every page of the report and usually contains information such as the page number and date. Each report can have only one page header and one page footer. A report header prints once, at the beginning of the report; the report footer prints once, at the end of the report. Each Access report can have only one report header and one report footer. 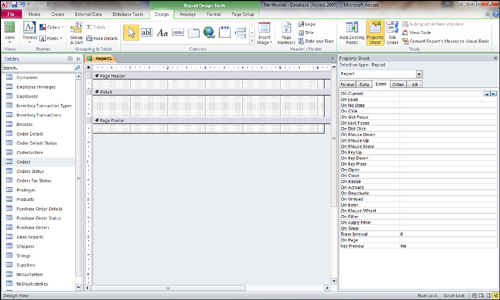 The report header is often used to create a cover sheet for a report. It can include graphics or other fancy effects to add a professional look to a report. The most common use of the report footer is for grand totals, but it can also include any other summary information for a report. In addition to report and page headers and footers, an Access report can have up to 10 group headers and footers. Report groupings separate data logically and physically. The group header prints before the detail for the group, and the group footer prints after the detail for the group. For example, you can group customer sales by country and city, printing the name of the country or city for each related group of records. If you total the sales for each country and city, you can place the country and city names in the country and city group headers and the totals in the country and city group footers.